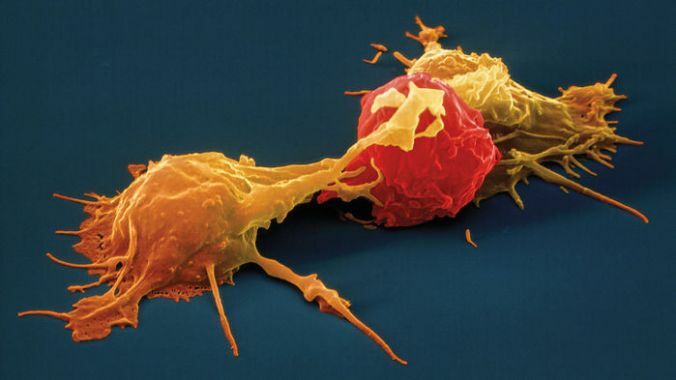 Cancer immunotherapy frequently goads T cells to fight cancer more zealously, and now it is starting to demand more of natural killer (NK) cells, too. All too often, NK cells find themselves on the sidelines, fooled by tumor cells that shed the stress proteins that would otherwise serve as “kill me” signals. But what if these tumor cells were obliged to keep what NK cells recognize as badges of infamy? To answer this question, scientists based at the Dana-Farber Cancer Institute and Harvard Medical School interfered with the stress-protein-shedding process. The stress proteins are called MICA and MICB. Although they may invite destruction by activating natural killer group 2D9 (NKG2D) receptors, they are also subject to proteolytic shedding. To prevent the shedding, the Dana-Farber/Harvard team deployed antibodies that were engineered to target the site where MICA and MICB proteins are cleaved. This approach, the scientists found, reduces the spread of melanoma and lung cancer in mice. Details of this work appeared March 30 in the journal Science, in an article entitled “Antibody-Mediated Inhibition of MICA and MICB Shedding Promotes NK Cell–Driven Tumor Immunity.” According to the article, this new cancer immunotherapy approach can prevent the loss of important immunostimulatory ligands by human cancers and reactivate antitumor immunity. In mouse models of melanoma and lung cancer, an engineered antibody called mAb 7C6 not only increased the presence of MICA and MICB on cancer cells, it also increased the infiltration of natural killer cells within tumors. In mice with metastatic melanoma that had spread to the lungs, treatment with monoclonal antibody (mAb) 7C6 helped reduce tumor load.